The global clinical laboratory services market is set for sound growth in the upcoming years owing to the rising awareness about the importance of early diagnosis of diseases. At present, consumers display a strong demand for advanced technologies that provide quick test results for examination of clinical specimens. This helps physicians to diagnose the condition at an early stage and administer appropriate treatment. Apart from this, the high prevalence of infectious diseases, incidence of seasonal diseases, and prevalence of lifestyle-related diseases account for the growth of clinical laboratory services market. However, lack of infrastructure and dearth of expert technicians in developing nations are some factors restraining the market’s growth. According to a report by Transparency Market Research (TMR), the global clinical laboratory services market was evaluated at US$208.0 bn in 2016. 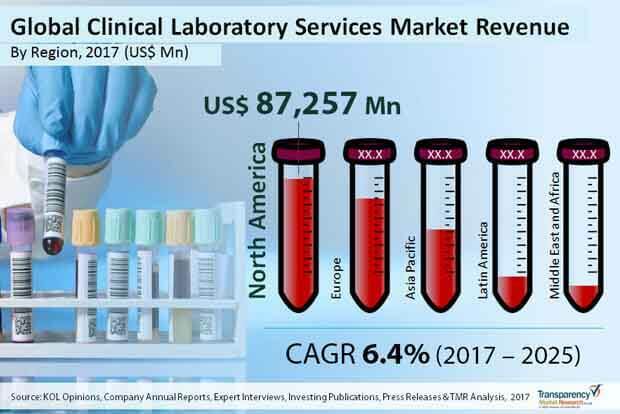 The global clinical laboratory services market is projected to display a healthy more than 6% CAGR over the 2017-2025 forecast period, enabling the market’s growth to a valuation of US$361.3 bn by the end of 2025. The report studies the global clinical laboratory services market depending upon a few parameters, viz. test type, service provider, and geography. Based on test type, the global clinical laboratory services market is segmented into clinical chemistry, medical microbiology and cytology, food intolerance test, human and tumor genetics, and other esoteric test. Of them, clinical chemistry test type segment is likely to clock more than 6% over the 2017-2025 forecast period and hold dominance over other segments during this period. The growth of this segment is attributed to the high demand for clinical chemistry examination that forms the basis to diagnose a large range of disease conditions. Clinical advancements in diagnostic techniques such as mass spectrometry and flowcytometry are furthering the growth of clinical chemistry test segment. However, medical biology and cytology segment is likely to expand at a leading CAGR of over 6.5% during the 2017-2025 forecast period. On the basis of service provider, the global clinical laboratory services market is classified into stand-alone laboratories, hospital based laboratories, contract research organizations (CROs), and others. Amongst all, stand-alone laboratories are likely to hold the leading more than 40% market share over the report’s forecast period. The significant market share of this segment is mainly because of increase in privatization, initiatives taken by market players to set up laboratories, advance healthcare infrastructure in developed nations, and government funding in several countries for modern healthcare. Hospital based laboratories segment is expected to display the leading growth rate of CAGR of 6.7% during the forecast period. User convenience is one of the key factors attributed the growth of this segment. Geographically, the report studies the global clinical laboratories services market across North America, Asia Pacific, Europe, Latin America, and the Middle East and Africa. North America currently dominates the global clinical laboratory services market vis-à-vis revenue; going forward the region is projected to display a notable 6.0% CAGR over the 2017-2025 forecast period. Huge investments from public and private sector to take the superior healthcare infrastructure a notch higher and prevalence of lifestyle-related diseases are some of the crucial factors that account for the dominant share of North America. However, Asia Pacific is anticipated to surpass all key regions and display the leading growth rate of over 8.0% during the 2017-2025 forecast period. Population explosion and high incidence of infectious diseases contribute to the growth of this regional market. Leading companies in the global clinical laboratory services market include Charles River Laboratories International Inc., SYNLAB International GmbH, Sonic Healthcare, NeoGenomics Laboratories Inc., Genomic Health Inc., Fresenius Medical Care, Laboratory Corporation of America Holdings, UNILABS, Quest Diagnostics Incorporated, and Eurofins Scientific among others. The research is a combination of primary and secondary research. Primary research formed the bulk of our research efforts along with information collected from telephonic interviews and interactions via e-mails. Secondary research involved study of company websites, annual reports, press releases, stock analysis presentations, and various international and national databases. The report provides market size in terms of US$ Mn for each segment and sub-segment for the period from 2017 to 2025, considering the macro and micro environmental factors. Growth rates for each segment within the global clinical laboratory services market have been determined after a thorough analysis of past trends, demographics, future trends, technological developments, and regulatory requirements. Geographically, the global clinical laboratory services market has been segmented into five regions: North America, Europe, Asia Pacific, Latin America and Middle East & Africa. In addition, the regions have been further segmented by major countries from each region. The report also profiles major players in the clinical laboratory services market based on various attributes such as company overview, financial overview, SWOT analysis, key business strategies, product portfolio, and recent developments. Key companies profiled in the report include Charles River Laboratories International, Inc., SYNLAB International GmbH, Sonic Healthcare, NeoGenomics Laboratories, Inc., Genomic Health, Inc., Fresenius Medical Care, Laboratory Corporation of America Holdings, UNILABS, Quest Diagnostics Incorporated, Eurofins Scientific etc.